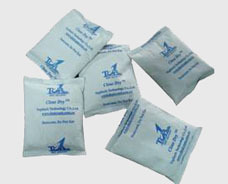 Mineral Desiccant is an effective means of moisture proof, can absorb moisture from the air, usually used in a sealed environment to reduce the humidity of the packaging, and prevent the product from moisture damage. It works by absorbing water molecules into their own structure in a physical way, or after absorbing water molecules, it changes its own chemical structure and becomes another kind of material. 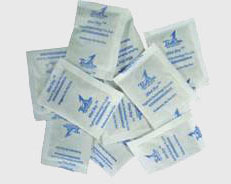 Topsorb mineral desiccant sachets are non-toxic, non-corrosive, environmental friendly, without any negative effects, DMF free. It has varies of specifications. Mini Dry: 3g, 5g, 10g, 20g, 30g, mainly used for sealed package of products, such as PE bag, aluminum foil bag, anti-static bag, boxes, etc. Close Dry: 50g, 100g, 200g, 250g, mainly used mainly in sealed package of cartons, wooden cases, containers, etc. Active Mineral: Low cost, fast performance, high adsorption capacity, non-toxic, tasteless, non- corrosive, and pollution-free. Clay: 100% nature, low cost, good performance in low humidity environment (at <30%RH, such as the vacuum package of PCB circuit board). TOPSORB mineral desiccants, Mini Dry, Close Dry are widely used in electronics, machinery, fabricated metal products, glass, chemical biology, medicine, optical instruments, pet products, food packaging and military products etc. It is always equipped in the shipping containers to prevent the cargo from moisture damage during ocean voyage.